In space, no one will hear you bleat... Plus a blade of grass on Arridis.... You must therefore explore the galaxy, visit wonderful planets, discover forgotten artifacts and find the fastest route to reach Edenia, a legendary planet with endless pastures, as the winner. 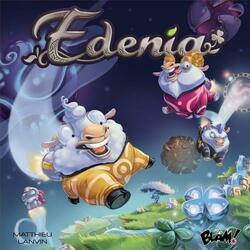 You lead a team of sheep whose objective is to reach the planet "Edenia". In turn, you choose one of your sheep and move it across the galaxy following the path in front of it. During their journey, sheep can discover a new "Exploration" tile, recover "Artifacts" giving special powers or conquer planets. The game ends when a player reaches one of the 2 immediate victory conditions (bring his 3 sheep to Edenia, have exactly 42 points) or when there is no more space on the planet Edenia: the player with the most points then wins the game!